Make sure you choose the right waterproofing / basement repair contractor. Don't get caught saying "I spent thousands of dollars waterproofing or repairing my basement and it still leaks - Now I can't find the contractor who did the work". FACT: On average, 4 out of every 10 waterproofing contractors vanish every 5 years. 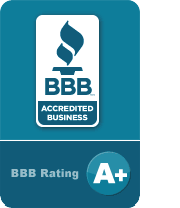 Basement Technologies has proven itself as a leading company within the industry with 1,000's of customers and NO unresolved complaints to the BBB. Check out Basement Technologies® BBB Rating! Most of Basement Technologies new customers are referred by past customers. Be sure your contractor can provide relevant references for the type of work you need to have done. Ask for names of customers who have requested warranty service to see how the company responds to call backs. The City of Hamilton, Ontario Building Department and other cities in Ontario will ask you if the contractor you're looking to hire is properly licensed. Again, use the company name as well as the company owners name to aid in this check. For example; a Masters Drain Repair License is required for weeping tile installation for waterproofing. You can reach the City of Hamilton Building Department at (905) 546-2720. Please download our DRAIN REPAIR LICENSES PDF document for proof of these licenses for Basement Technologies®. Please download our BUILDING REPAIR LICENSES PDF document for proof of these licenses for Basement Technologies®. Job site liability insurance protects you if an accident occurs, causing property damage, that the contractor can't afford to fix. Ask the contractors' insurance company name, policy number, expiry date and phone number - Then CALL!!! Workman's Compensation (WSIB) protects you if an accident occurs, involving one of your contractor's employees, on your property, causing injury or death. It is now MANDATORY that all contractor's have a WSIB Clearance Certificate to perform work at your home. Request a WSIB Clearance Certificate (good for 60 days) to protect yourself! We here at Basement Technologies® are concerned with protecting our clients, that's why we always hold a $5 million dollar liability insurance policy. Please download our INSURANCE PDF document for proof of this insurance policy for Basement Technologies®. Please download a copy of our WSIB Clearance Certificate PDF document for proof of Basement Technologies® registration with the Workplace Safety & Insurance Board. We at Basement Technologies® encourage potential customers to go through our extensive "Job Site Questionaires" in order to read through what others have to say, and to also contact past clients who have given us permission to hand out their phone number as a reference. When shopping for a contractor, make sure to request some client references with their contact information so you can find out on your own about the companies: work ethic, accountability, and reputation. Contractors should be ready and willing to provide you with that information, if not, that may be a sign of a bad-reputation. View over 100+ CLIENT TESTIMONIALS, or contact us for reference phone numbers to contact on your own.